I was able to find some hours to be out and on my own again, yesterday. I had planned to go out all day, but deep down I knew I wouldn't. My son had his first outing/overnighter, my 2 little girls would be taking the schoolbus and walk home all by themselves and my wife was working, so there'd be no backup, just in case. It's this dadthing, that I just can not turn off..... There is also a full moon coming, making me more jumpy and on edge than usual and as icing on the cake my boss called to complain about a complaining customer, who had nothing to complain about. So my inner peace was out the window and I ended up, just walking all morning instead of taking it slow. The upside on that is that I did get a much needed workout and I was able to burn of much of that "heavy urbanenergy", if you know what I mean. The weather was forecast to be cloudy with sunshine and temperatures up to 20C. Don't know which part of the country they had in mind, but it certainly wasn't here! There was fog, wind and when I left the temperatures reached a meager 10C. I wasn't going to my usual stompinggrounds, but instead I wanted to explore a naturreservation close by. It isn't big and much of it is not accessible, either because it is prohibited or simply unaccessible by nature, meaning some very high and very steep cliffs. This area is called the Bispbergsklack. It is a large mount of rock sticking out of the landscape, with a height of 315 meters above sealevel. Not all that much, but due to its location and position home to an exceptional microclimat and thus habitat for flora and fauna. As I said, there was fog, but I expected it to be on groundlevel, as it is quite normal here. So I figured the top would be above the clouds and I was allready anticipating the views I would be having. Well, I was to be disappointed. Up there the clouds were even thicker, but that gave the landscape a magical and mysterious look! It was awesome! This is what must have given trollstorytellers and others their inspiration. I left home early, knowing that this time of day on a working day and with this weather, there would be very little chance of coming across other people. I did came across groups of trees where many small birds were flying around and calling to each other. When I stood still under these trees, the birds would hop from tree to tree, slowly coming closer to inspect this strange twolegger in green. The route lead up the hill to the top on the Jätteklack, the southside of this hill. From there I followed a path around the top leading to the northside, being the Bispbergsklack. There is a third part to this reserve, but that is off limits and inaccessible. is this what I think it is? That famous dark fungus? I did not see any large animalsigns, none whats however. The largest signs I saw where foxmarks. This one was so prominently deposited, right on top of a large block of a mosscovered stone. There was another one, maybe about 40cm next to it, but that was decomposing. Christmas came early or what? A dead pine, having shed all its needles, yet the beardmoss remains. The going wasn't all that easy. The path was quit rugged. This edge is the Bispbergsklack. In the distance, somewhere is where I live. Right next to the top was this remarkable tree. It guess it had broken and triggered the growth of 2 new branches. The original tree had rotted away, leaving a cavity right in the middle. From here the path went downhill, to the base of the hill on the southwestside. From there it is up again to the startingpoint. Someone has been eating its fibres.... Beetles in this case. A part of the trail lead right through here; wastehigh grass with small paths going right through ehere and there. Paths made by animals, so I wasn't to happy about crossing this. And rightly so, I discovered two hitchhikers, one of the scene and another one home; deerticks. How in the world did this get here? An oaksappling with no oaks anywhere around. Guess a bird dropped it here. Just hope this little fellow will grow into a grand and proud tree. Once I reached the startingpoint on the southtop again, I figured I had deserved some lunch. Nothing fancy, just some homemade bread and coffee. Since I was going to visit this place, I brought my Swedish messkit, so there would be no need for an open fire. While the water was heating I saw this branch, full of mosses, at least 5cm thick. Beyond here, there was the great "Nothing". I could not see any further than the cliffface and the world just stopped, vanished.... wasn't there. A really strange sensation. I did here some birds of prey call, out there somewhere to the left. This cliff is known as the roosting- and nestingplace for the pilgrimfalk (falco peregrinus), for instance, and the berguve (Bubo bubo) is also found up here. Beyond the edge, there was the great "Nothing". I could not see any further than the cliffface and the world just stopped, vanished.... wasn't there. A really strange sensation. But I also had noticed all along the trail that if you can not see far around you, you are forced to look closeby and rediscover the small wonders right at your feet and in your face. Some people are so stupid. I found close to the cliff's edge. Right in the middle of the natural reserve! I took care of it and scattered the rocks, woodblocks and coals all around. I then camouflaged the scorged surface with pinedebris. When i went home, the place looked like this. All this time I carried my recovered leather backpack and had no problems with it. I loaded it up with the messkit, a filled up lunchbox, 2 0.75L canteens, an army poncho, a relatively large set of binoculairs and a jacket. All in all a good 7kg's. I will make some adjustments to the pack, like adding some D-rings to the shoulderstraps and add a wastebelt, so I can hang a pouch or two on it. Makes it easier to carry small stuff when not having pockets. In the previous post I mentioned I do not get out much..... Well, that is not entirely true. Last friday I did get out into the woods, but in a very different way than usual. In the village I live there are quit a number of traditions and one of them is to have a charcoal kiln every year at the beginning of autumn. To me this is completely new and I was invited to witness the lighting of this kiln and to be introduced to the team that does this work. The idea behind that is that I, in time, will learn this old skill, too and to take over from the older guys in due time. On the scene I met the lot of them and they explained to me who was who and how things were done. They told me how to build up a kiln, what to do and think of etc. etc. This year they tried a new type of kiln; a so-called flat lying kiln, as opposed to the round one they usually do. As said this was a try-out and things didn't quit work out as intended at first, because, while building this kiln they made a few minor errors, but eventually they got this one going too. Yes, she is smoking... finally! If I understood correctly, this kiln will burn for up to 2 weeks untill all the wood within is charred. This means that there have to be 2 people on site 24-7 for this period in order to maintain the kiln. They do this by sleeping in a hut on site and what a great little hut that is! It is a hut for 2, containing 2 bunks with a table between them and a fireplace.... that's it. The hut is made up out of logs, finished with planks on the inside and piled on mossturfs on the outside. These turfs still contain living material and in time they grow together﻿, forming a hollow kind of hill. We could literally eat raspberries and fungi from the roof and walls! the fireplace. I took this picture without flash to give an idea of how little light does get in. I was told I was free to use this hut whenever I felt like it, if it was free. So you can guess where I'll be staying this winter. I am also free to use another hut, nearby...... Whoopee! We were out there for a few hours untill the kiln was going strong, the light faded and the mosquitos became almost untolerable...... but in this time I did wonder around a little by myself, scouting the terrain, seeing plenty of mushrooms and one of the biggest anthills I have encountered here so far! The next day I went back with my family, because that night was the official milkväll; the night of the kiln. Many from around gathered here to celebrate another succesfull lighting and this is done with live music localstyle, food and drinks, a lottery (national addiction) and most of all socialising. One of the specialties is the socalled kolbulle, basically a thick pancake, baked in pigs'grease, with plenty of salt and bacon, topped with a good spoonfull of lingonberriejam. It is quit good actually..... once you get used to it. mine looked a lot tastier, but both tasted good..... and filled you up! And as a nice encore.... Woodsmoke, caught in the rays of the setting sun, casting them between the trees.... To me that is what it's all about! OK..... one more afterburner.... The insideglow of one of the Finnish torches (or Swedish, the debate is still running). I do not get out into the woods much these days, so I have to pass time in another way. So I keep myself busy with outdoor-related things to do. 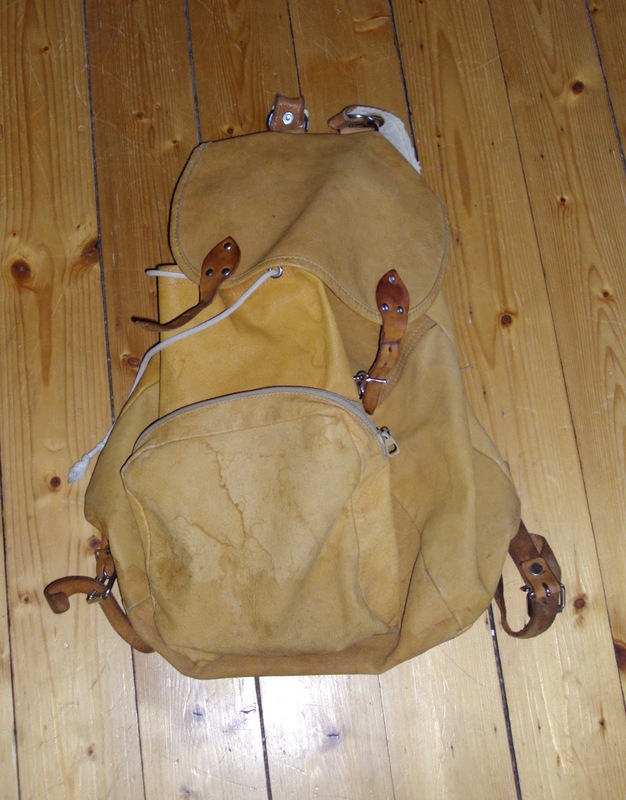 One of these projects is bringing an all leather rucksack back to life. I bought it on a yardsale yesterday for an astonishing 5SEK.... yep €0,60 or $0.75. I just could not pass on it. 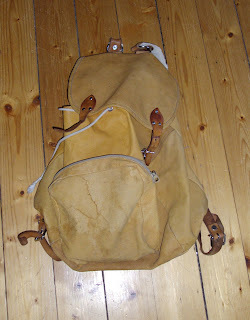 The leather had a mustardyellow colour, had some nasty waterstains and was dry like parchement. The zipper from the frontpocket was broken, too, hence the low price. Upon inspection at home I found the zipper itself inside the frontpocket, so all I had to do was reinsert it and sew up the loose ends. I also had to restitch some of the thread of the shoulderstrappadding. Add 2 treatments with leathergrease and you get an entirely different backpack! All in all I am very pleased with this purchase and with the endresult. I figured that for those 5 kronor I would at least end up with a good amount of leather for DIY-projects, but ended up with a suitable daypack. 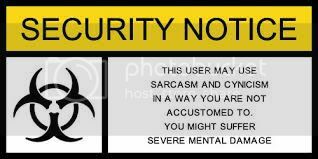 I filled it up and tested it. Fit is comfortable, but I will have to try that in earnest one of these days. There is a sort of wastestrap.... well actually is runs across the lower horizontal steelstrip on the lower back. I have no idea what its purpose is, but I am already considering adding leather straps to it, so it will go around my waste and be a proper wastebelt. The cotton closingthread will in due time be replaced by a leather one, offcourse. Deplastification.... both outdoors and at home.